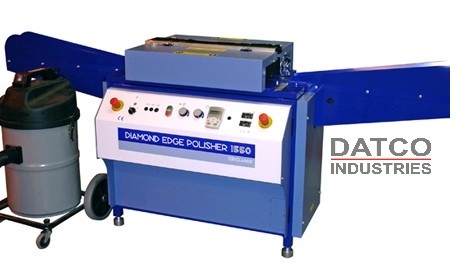 Diamond Edge Polishing machines convert thermoplastic sheet edges to a brightly polished surface in one operation. Polishing is carried out by a cutter hub fitted with diamond tooling. The cutter hub is mounted onto a variable speed precision spindle which rotates at 12000 – 20000rpm. Feed tracks on either side of the cutter hub accurately guide the material over the cutter. A belt transport system feeds the material across the cutter at around 1 metre per minute, automatically compensating for different material thicknesses. Thinner panels can also be stacked together up to the maximum capacity of the machine. Polishes saw cut edges in one pass. Polish materials up to 55mm thick. Can polish multiple sheets at once. 1117mm infeed and outfeed tracks.